My friend, who had ridden his bike to work, noticed the rain as he was getting ready to leave. He questioned whether his book-bag would be okay getting all wet, so I offered him my car. He then went on to explain that he had a funeral so he wouldn't be able to bring my car back until much later that evening. That would mean that I would have to stay at work during my 2-hour break rather than going home. I had some work I could get done there, so I didn't mind at all. He then said, "Well I'll bring you back chipotle!" I was PUMPED! During my break, I was sitting doing my work and he came in with chipotle, I was SO excited! See, I KNEW I was going to get chipotle, but I thought I wasn't going to get it until after he was done using my car! He brought it so much earlier than what I was expecting and added the chips and guacamole! He exceeded my expectations! The lord has spoken promises to your heart. Maybe He has spoken to you about restoration, about a relationship, about healing, or finances. What He has promised to you WILL show up, and it may be much sooner than you expect! You know it's going to happen, but what if it happened today? How would you act? 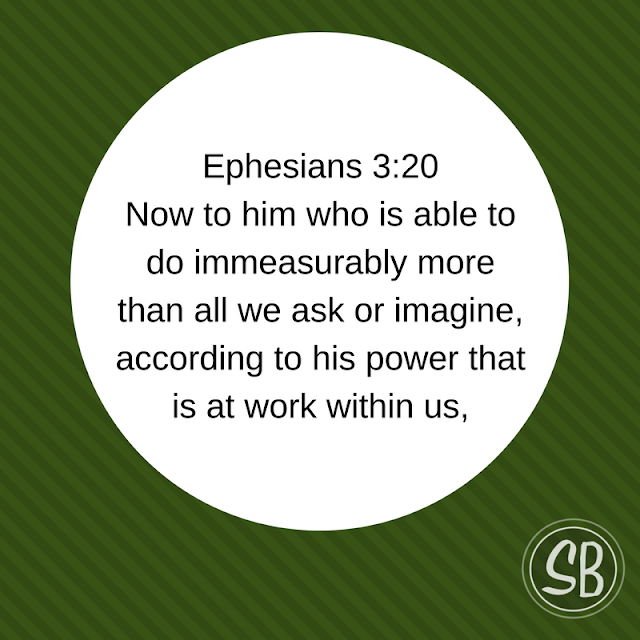 We serve the God who does exceedingly and abundantly MORE! Your suddenly moment is on its way! Today, as you go about your day, be expectant! Today is blessed, YOU are blessed, everything you touch is BLESSED! Get your hopes up!